The gin and tonic is making a break from its granny and crystal glassware image, away from the tennis court sidelines and into the heart and soul of vibrant cities (read more about the gin craze here). So when a gin made with truffles hits our shelves, it’s all we can do not to shout it from the rooftops. 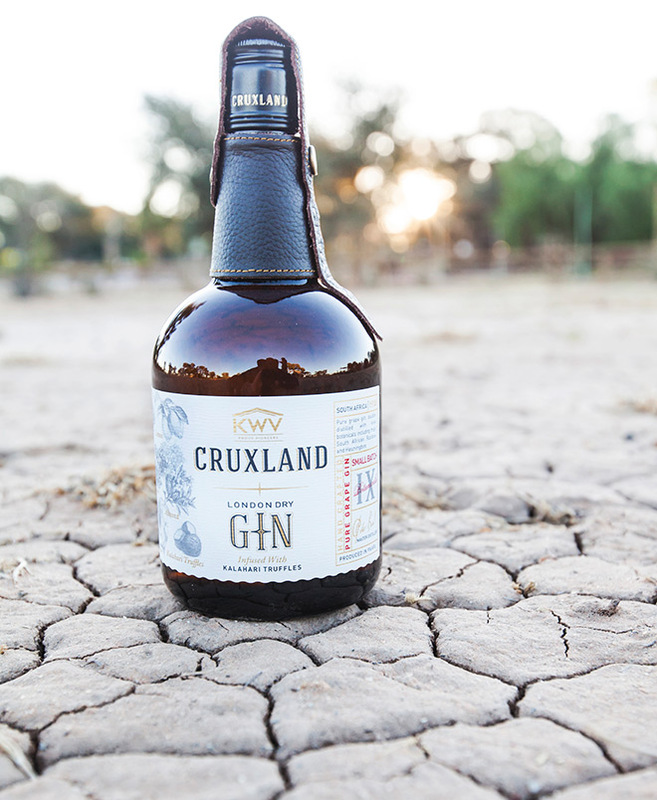 Introducing KWV’s Cruxland Gin. Stock those bars – you’re not going to want to miss out on this one. The story goes that from generation to generation, the nomadic people of the Kalahari desert would talk of finding ‘treasures’ in the sand. When lightning struck, they would search for the X-shaped cracks in the earth where the lightning would reveal these ‘treasures’, or !N’abbas – the extremely rare Kalahari desert truffles that burst up from the ground when heavy rains and autumn moisture had caused them to swell. The name Cruxland Gin came about because the nomadic people of the Kalahari would call these vast expanses of desert, land of the stars because of the lighting shaped X cracks in the soil. And since the Crux Constellation is another name for the Southern Cross, the inspired makers of this artisanal gin decided to pay homage to the truffle and named their gin Cruxland. KWV’s small batch of premium gin is a double pot distilled London Dry Gin which is then re-distilled with 100% grape spirits. Its sophistication comes from being infused with the earthy taste of these treasured truffles, along with juniper berries (of course) and nine other signature botanicals. It is also cold filtered for that extra smooth taste. Get out that deck chair and put those feet in the sand. This is a gin to be enjoyed while soaking in some Spring sunshine and catching up with old friends. Expect a fresh aroma of juniper and lemon, enhanced by coriander and spice and the earthy hint of Kalahari truffles. Taste the juniper berries as you take your first sip; the spice from the coriander, aniseed and cardamom and then the cooling finish from honeybush, rooibos, almond and lemon. This is a sophisticated and elegant gin and is probably best enjoyed neat, over an ice block or two. It will of course also work well as the base for a classic gin and tonic, Martini or any of the gin cocktail greats. Light the braai, crack that ice tray and pull a lemon from the tree, it’s gin o’clock.